Unifor's collective agreement between CAMI workers and General Motors is set to expire in September. Editor's note: An earlier version of this story used an incorrect figure for Equinox production in Mexico through August. The correct figure is 40,017. TORONTO -- Canadian workers assembling General Motors’ top-selling crossover are on strike. 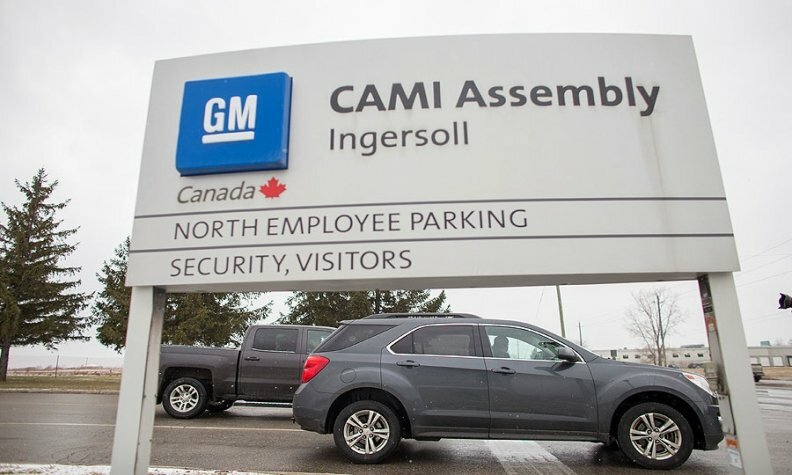 Unifor Local 88, which represents about 2,750 workers at CAMI Assembly in Ingersoll, Ont., said in a Sunday night post on its website that its bargaining committee was not able to reach a tentative contract with GM. "While General Motors of Canada and our Unifor partners have made very positive progress on several issues over the past weeks, the Company is disappointed that we were not able to complete a new agreement," GM said in a statement late Sunday. "We encourage Unifor to resume negotiations and to continue working together to secure a competitive agreement." The strike stops most production of the Chevrolet Equinox, GM’s top crossover model in the United States and Canada. Local 88 instructed its membership to begin striking at 10:59 p.m. ET on Sunday as its previous contract expired. This is the first time Canadian autoworkers have gone on strike against a U.S. automaker since 1996. That year, the Canadian Auto Workers, Unifor’s predecessor, walked out on GM plants nationwide in an effort to secure jobs at Ontario plants. This strike again appeared to be driven by a desire by union leadership to secure jobs. GM last month wrapped up a round of layoff at the plants as it shifted GMC Terrain production from CAMI to Mexico. About 400 workers were laid off, while another 200 took early retirement packages earlier in the year. Unifor Local 88 President Dan Borthwick said the two sides remain far apart on “language issues, economic issues that are still outstanding, and, most importantly, job security.” He said GM would not budge on Unifor’s demand that it commit long-term to the plant through new products and investment, making a strike necessary. "We put our best foot forward, and we don’t believe the company is serious about our membership’s demands,” he said. GM last invested in the plant in 2015, when it spent $800 million to equip it for production of the redesigned Equinox. The strike comes following a round of contentious labour talks. The union described a contract as virtually impossible to reach on Saturday night, though it said progress was being made late Sunday before the deadline hit. A long-term strike could have a major impact on GM’s North American sales and bottom line. The Equinox is GM’s top-seller in a booming crossover segment, as U.S. sales have gained 17 percent to 185,223 units this year through August. Canadian deliveries surged 40 percent to 3,182 units. GM has fewer Equinox crossovers in stock in the U.S. than it did about a month ago. According to the Automotive News Data Center, U.S. dealers held about 53 days of Equinox supply on Sept. 1, well below the 74 days of stock they held on Aug. 1 and behind the average 82-day stock for all Chevrolet models. While CAMI is not the only North American plant to assemble the Equinox, it produces the most by far. GM also builds the crossover at its San Luis Potosi and Ramos Arizpe plants in Mexico, though the two plants have combined to build 40,017 units through August of this year, according to the Data Center. CAMI built 132,288 of the crossovers during that time. Workers at the GM CAMI plant, a joint venture between the automaker and Suzuki until 2009, are on a separate contract from other GM plants in Canada, which received four-year labour contracts last year. GM committed to $554 million in investments at those plants over the four-year contract.